How do we get our family to eat a lot of greens? 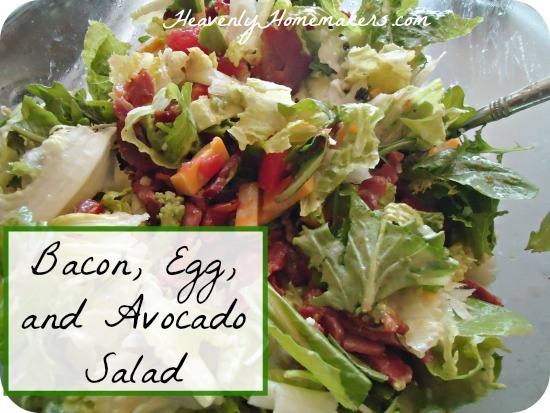 Put bacon, eggs, and avocado in the bowl with the lettuce. Rarely is my family of men pleased to see a lovely bowl of salad as the main dish at lunchtime. You can almost see the “am I gonna get full? !” look of panic in their eyes. After all, typically a tossed salad lunch just doesn’t stick with a person very long into the afternoon. But if there’s bacon in it? And boiled eggs? And avocado? And cheese? Well, now we’re on to something. My family devoured this last week when I made it – even the boys who don’t typically love eating avocados. With all the other flavors mixed in, this salad with all its goodness works for even my pickiest eaters. Along with the salad, I served fresh pineapple, fresh cantaloupe, and a new recipe I was experimenting with: Coconut Fudge Bars. We were all very full after our meal – and stayed full until after we got back from swimming that evening at 5:15. At that point we were all ready to eat our own beach towels – but that’s typical no matter what we’ve eaten for lunch. Toss ingredients together and have a feast. Prepare all ingredients in advance, from cooking the bacon to boiling the eggs to chunking the cheese. Toss the fixin’s into a jar or bowl with a lid before heading out for the day. Put the dressing into a separate container to add just before eating. These ingredients, prepared in advance, will last a week or two in the fridge for quick salad prep. If you chop your avocado ahead of time, simply place the avocado pit into the container to help maintain the nice green color. You really have to try this salad. Really – even people who don’t normally love salad should love this one. It has bacon in it, for crying out loud. It’s happiness in a bowl. Hey, have any of you tried the “Salad in a Jar” idea? I am excited to try that sometime, both because it’s a great packaging idea…and of course, because it involves a jar. It’s happiness in a jar. With bacon (for crying out loud). 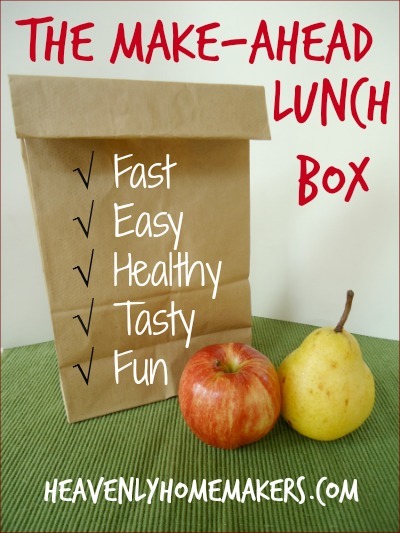 Find more Make-Ahead Lunch Box recipes and be sure to follow along in this series for more fun ideas! I would love to do the salads in a jar because I make them everyday but the original salad in a jar site says to seal the jars with a vacuum sealer which I do not have. Have any of you tried it w/o a sealer? I would hate to make them up and then have brown lettuce the next day. This looks delicious! I love the flavor combination of egg, bacon, and avocado for breakfast. Now I can have it for lunch, too! Thanks. Pinning it now.